Denis Island is a flat coral sand cay island, some 143 ha in extent, located on the northern-most margin of the Seychelles Bank. The Island is privately owned (Denis Island Development (Pty) Ltd) and implements its conservation program in collaboration with the Green Islands Foundation (GIF). When Denis Island was discovered in 1773 it hosted large seabird populations including a colony of Sooty Terns (Sterna fuscata). In the following years the birds left, due to various reasons mainly habitat change. 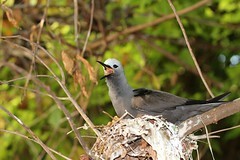 To re- establish a colony an area of a former coconut plantation was cleared as the Sooty Tern is a ground nesting species that requires open grassland. 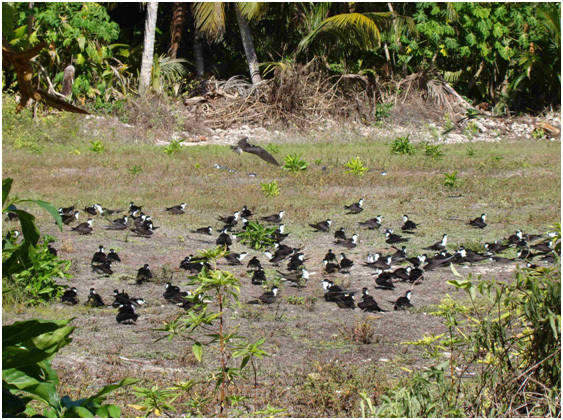 Since the sooty tern re-colonization project initiation in 2008, preparation of the site prior to the breeding season has always preoccupied keen environmental enthusiasts on Denis Island. This includes the removal of encroaching plants and trees, the cutting of grass to a suitable height and placing the Sooty models and loud speakers. This project is unique, based on the knowledge and under the supervision of Prof. Chris Feare. The dummy birds and the playing of the Sooty colony noise through the speakers shall encourage the birds to nest on the prepared site. Monitoring commences every year around May with the arrival of the birds. Within the years the number of Sooty Terns increased continuously, some eggs were laid but unfortunately no incubation took place up to now. Despite no breeding success yet an improved establishment of the Sooty Terns on site has been recorded and we are happy that the birds accept the area as suitable for nesting so we hope the best for the following years. Next SSG news: An investigation into possible infanticide by Tropicbird 42 on Cousin Island, March 4th 2013.